There’s no doubt about it, Cadillac is on a roll. Or, to be more precise, they continue to be on a roll. Things began to turn around for the brand previously associated with Sansabelt slacks when the first-generation CTS sedan appeared in 2002. Ushered into existence by an internal design ethic called “Art and Science,” the compact sedan featured sharp edges that, to this day, stand out in a crowded marketplace. At the same time, the first CTS was a pretty handy car from a driving dynamics perspective. While it didn’t possess the handling or power delivery characteristics to match the German sport sedans, it moved Cadillac closer to that mythical goal. The first CTS was Cadillac testing the waters, venturing out of its comfort zone and seeing how many of its customers, new and old, would come along for the ride. The first CTS paved the way for the second, an even more striking design with even higher performance standards that premiered in 2007. All of a sudden, Cadillac was an enthusiast brand—and not just with those in a hurry to hit the early bird special at Applebee’s. That enthusiasm has continued right up to present day as the brand’s sedan fleet—the third-generation CTS and second-generation CTS-V, the world-class ATS, and the surprisingly good XTS—is as strong as ever, if not stronger. This healthy base has allowed Cadillac to take some chances. Earlier this year, they released the ELR, a racy plug-in hybrid luxury coupe based on the Chevrolet Volt. By its very definition, the ELR will be a low-volume vehicle. But this is precisely the kind of vehicle Cadillac can get away with, secure in the knowledge that it’s not needed to boost the bottom line, only to solidify brand image. Nevertheless, for all the qualities that the current fleet of Cadillac passenger vehicles possesses, the backbone of the brand—in terms of sales, at any rate—remains its dynamic crossover/SUV pairing, the SRX and the Escalade. The former appeared in 2003 and has, since 2010, been their bestselling vehicle in North America. The latter, despite sales figures, acceleration times, or any other such mundane considerations, is the undisputed halo vehicle for the entire brand and has been since its introduction in 1998. At the time, the Escalade was part of a burgeoning interest in large SUVs, particularly those of the luxury variety. The first-generation version was not much more than a GMC Yukon Denali with a Cadillac crest, but interest in the vehicle was strong right from the start. It was the second-generation version, though, that propelled the Escalade deep into the collective consciousness. The introduction of this version, for the 2002 model year, saw the mammoth SUV become a preferred ride for sports celebrities and grow more popular than ever. Annual sales for the Escalade in North America roughly doubled compared with the original version. Cadillac was riding high—literally and figuratively—and this theme continued when the third generation made its appearance in 2006. Then, as history remembers, the economy made a U-turn, and parent company General Motors suffered more than most. While the manufacturer was busy restructuring its finances, investment in certain model lines was put in “park”. As the third generation Escalade began to go on and on in years, sales fell from their absolute peak. But the Cadillac retained enough of a market presence to allow GM to invest in other vehicles that required more immediate assistance—vehicles that might have vanished had they gone any longer without a significant revision. Now, after eight long years, it’s time for generation four—an all-new Cadillac Escalade that should place this vehicle back in the spotlight. In almost all respects, the Escalade has always been a pure luxury vehicle. Of course, it’s also a large SUV with all the characteristics that this classification implies: a lofty seating position, plenty of space, and the availability of four-wheel or all-wheel drive to get where you want to go. But these qualities are an afterthought compared to this simple brand promise: the Escalade is the Cadillac of large SUVs. And the 2015 Cadillac Escalade is even more so. Under the hood, there’s an engine of the same type as was found previously—a 6.2-litre V8—but it’s been redesigned to deliver more power, more torque, and greater fuel efficiency. Specifically, the gains include close to 5 per cent more horsepower (to 420) and 10 per cent more torque (460 lb-ft), with the engine tuned to provide more response at lower revs. The V8 also features direct injection, variable valve timing, and cylinder deactivation technology to cut fuel consumption when power is not required. 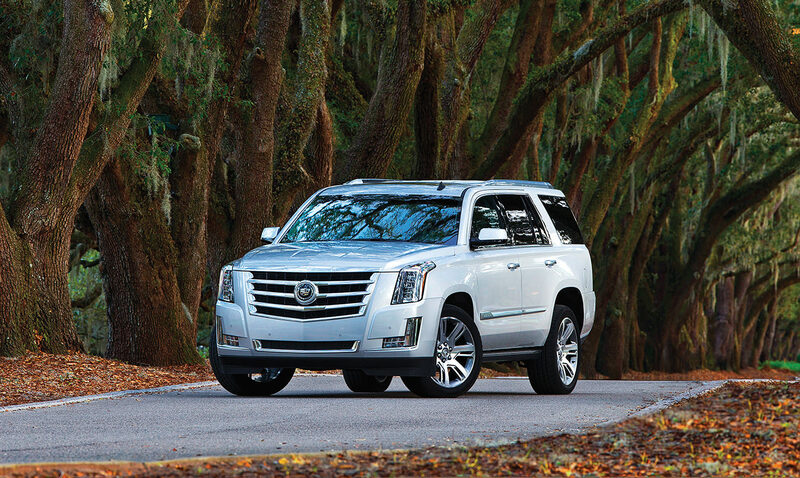 While the Escalade is not the vehicle for stone-cold stoplight battles, it possesses a level of performance that might best be described as effortless. To keep pace with that performance, the chassis and suspension system have been upgraded to create a quieter, smoother, and more measured ride. 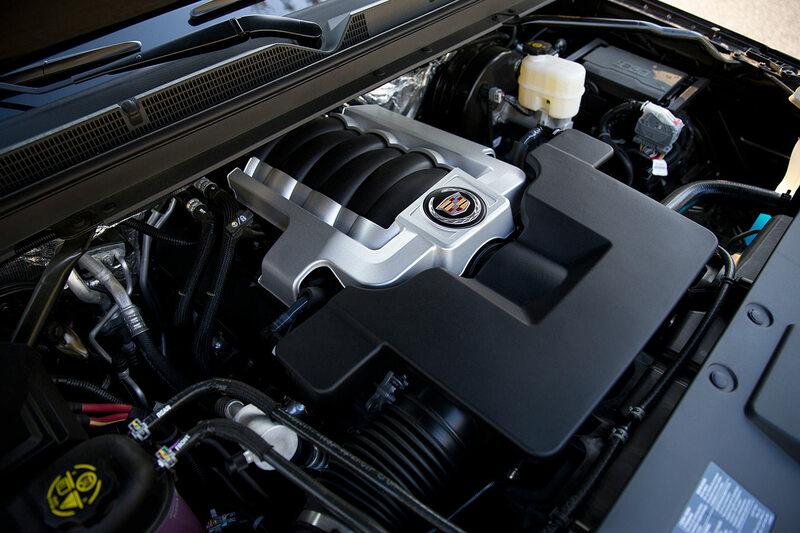 The Escalade also features a new version of the Cadillac magnetic ride control system, which uses electronically controlled shocks filled with fluid containing iron particles to provide precise damping. If this suspension system sounds complex, that’s because it is; Ferrari employs the same technology for their fleet of exotic machinery. The new generation features a wider rear track for greater stability, new electric power-assisted steering, and standard disc brakes with improved pedal feel and up to double the durability of the previous generation. Carving corners will never be a strength of this particular Cadillac, but the big SUV showed composure at speed through sweeping turns. The standard all-wheel drive and stability control system kept things planted well for such a tall SUV. From a design perspective, it’s exceedingly difficult to make a large vehicle as elegant as a smaller one. There are dimensional requirements to take into consideration when creating what is, effectively, a shipping container on wheels. The three current Cadillac sedans arguably make up the best-looking 4-door fleet in the business. But only a few design elements found on those cars have been carried over, such as the sharp creases, LED headlights, and LED tail lights. Although the Escalade doesn’t resemble the ATS or the CTS or the XTS, it’s nevertheless easily the most compelling large SUV ever to wear the Cadillac crest or, for that matter, any General Motors logo. 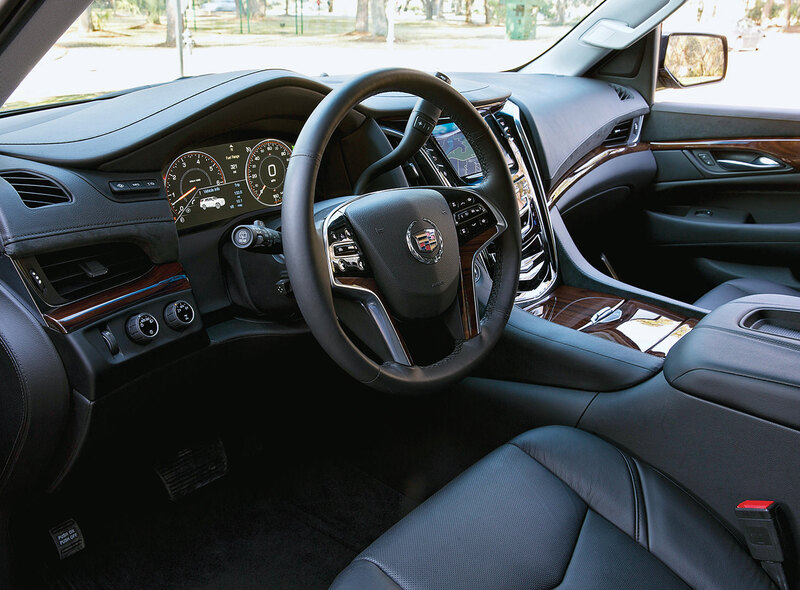 Upon first glance, there’s no question that the Escalade is still a profoundly massive vehicle, yet it possesses a stance that somehow manages to offset some of that size—like a linebacker that can run the 40-yard dash in around 4.5 seconds. The bigger impression, both literally and figuratively, is made by the all-new interior. First, there’s even more usable space than before. The front seat offers increased headroom and increased legroom, while the second- and third-row seats fold flat to create a larger and more convenient cargo compartment. For those who need even more room to stretch out, the Escalade ESV has a wheelbase 355 millimetres longer than the standard version, which translates into increased space for rear-seat passengers, as well as 60 per cent more cargo space behind the third row. As before, all versions of the vehicle can accommodate up to eight passengers. For even greater convenience, the Escalade features a hands-free liftgate and switches in the cargo compartment to trigger the power-folding second- and third-row seats. But these great qualities finish a distant second to the sheer luxury of the passenger cabin. Without question, the design brief in tackling the fourth-generation Escalade was to bring to bear a level of craftsmanship that simply did not exist before. The discriminating observer will first notice the tactile quality of all the materials, because it’s absolutely first-rate throughout. The net effect is stunning: if you somehow manage to disregard the lofty ride height of the Escalade, you can easily be convinced you’re sitting in a superluxury sedan that costs upward of $200,000. There is no direct competitor that can compete with the Cadillac in this respect; it absolutely stands alone. The 2015 Cadillac Escalade will never be mistaken for a sporty SUV—it’s just not that kind of vehicle. It’s also not likely to see much off-road duty, despite its AWD system. The Escalade might not even be used for traditional truck-like duties, such as towing, even though it has a healthy tow rating of some 3,600 kilograms. But what this Cadillac will provide is significant pride of ownership because there’s currently only one true icon in the world of large luxury SUVs—and this is it.